This story was updated at 11:29 am ET. BOSTON — Astronomers have created the most complete 3-D map of our local universe, revealing new details about our place in the cosmos. "I think it speaks to our desire to understand our place in the universe," said Karen Masters of the University of Portsmouth in England, during a press conference today. "I wouldn’t be happy if we didn't have a complete map of the Earth. It's nice to have a complete map of where we live." The map was assembled using data from the Two-Micron All-Sky Survey (2MASS) Redshift Survey (2MRS), which took 10 years to scan the complete night sky in near-infrared light. The survey used two ground-based telescopes, the Fred Lawrence Whipple Observatory on Mt. Hopkins, Ariz., and the Cerro Tololo Inter-American Observatory in Chile. Near-infrared light, which is of a longer wavelength than visible light, can penetrate the opaque clouds of dust common in galaxies. This allowed the 2MRS survey to extend its "eyes" closer to the plane of the Milky Way galaxy than has been possible in previous studies, because that area is heavily obscured by dust. Masters presented the new map here today at the 218th meeting of the American Astronomical Society. 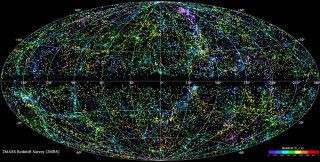 The 3-D aspect of the map comes from the fact that researchers measured the cosmic objects' redshift, which denotes how much its light has been shifted toward the red end of the color spectrum. This happens because of the so-called Doppler effect, which causes the wavelength of light to be stretched when the light's source is moving away from us. Because the universe is expanding, measuring an object's redshift, and hence its velocity, allows astronomers to deduce its distance, because objects that are farther away are moving more quickly. In addition to providing a more complete picture of our place in the universe, the new map could help solve the perplexing mystery of why the Milky Way moves the way it does with respect to the rest of the universe. This motion, about 370 miles per second (600 km per second) has yet to be explained by the gravitational attraction of the known objects near our galaxy. "The most important science question that having a complete map addresses is the source of the motion of the Milky Way," Masters said. "What's causing that is gravity, and finding the source of that gravity, where the mass is, has been a longstanding issue. Only by making an all-sky map can you account for all the galaxies that are there. We should now be able to account for that motion." For example, one structure revealed for the first time in the new map is likely to exert a gravitational tug on the Milky Way and could be part of the solution, the researchers said.